The F1-6 is our flagship 6" prop FPV Racing quad. 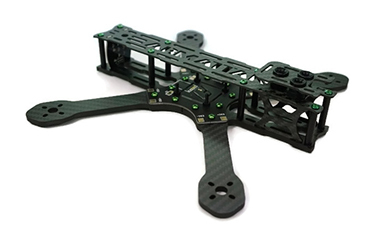 Designed as a true X quad, it comes in at 147g for the frame full assembled. The motor span is 250mm for extremely fast and stable flight. We recommend 20a+ ESCs running 2204/2300kv motors with 6" props. This is not a novice frame. 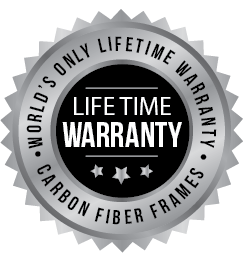 The carbon fiber center plates and arms are covered by our lifetime warranty. I have the F1-6 frame, with KISS FC, KISS 30A ESCs, Cobra 2206 2100kv motors usually running HQ 6045x3 props, an Aomway 200mw VTX and the required HS1177 Camera. I run all this on 1800mah 75-150c 4s batteries. I've had my frame for over a year now, in that time it has been bashed, crashed, clattered, banged and smacked into various objects and stuck in trees, all as I've learned to fly FPV. Its a tough frame! I did manage to break two arms, when i hit a stone wall at maximum throttle going at full speed and misjudged a gap. Within 30 mins of my e-mail Natasha had sent me a warranty code and 2 new arms were on there way to me! The build is nice and simple, the ESCs go on the nice wide arms with power pads in the right place, there is a space on the PDB for a Voltage Reg for your 5v supply if needed. The new cam mounts are superb, holding the camera angle even in the worst of crashes. While the top plate isn't covered under warranty, even with all the smashes I've had, I've not managed to break mine yet. The downside - mounting the VTX antenna on the top plate has cost me a lot of antennas! So i moved it so it comes out the back. Other than that i can't think of any! !